Does your Mother love beautiful flowers? These look like flowers that are blooming just for her. Don’t you think she would love to receive these beautiful flowers for Mother’s Day? I know I can picture giving them to my mother and seeing her smile. The Abstract Impressions stamp set will do that. 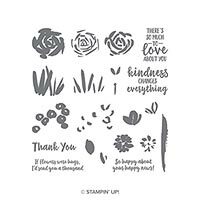 It is a beautiful stamp set that will work for any occasion. Not just Mother’s Day. By the way, it is a carryover. It is designed for two or three step stamping. However, it is super easy. Paper: Remember I always use Whisper White as my base. Sign up for my newsletter and receive a FREE gift plus PDF every week. Delivered to your inbox every Tuesday. You won't miss any exciting news and ideas. Do you want it all with a discount? Then join my team! I’ll help you save as a hobby demonstrator or give you pointers on growing your new business! Pretty flowers, thinking of moms! Such a pretty card, Pamela! Great job! !